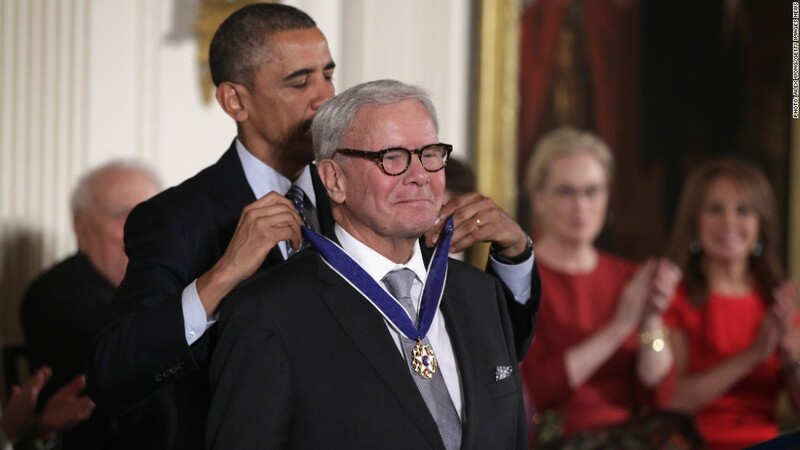 Tom Brokaw was awarded the Presidential Medal of Freedom in November. NBC great Tom Brokaw is ending the year with good news: His cancer is in remission. "A year ago my future was more uncertain than I cared to acknowledge but now I face the New Year with very encouraging news," he wrote in a letter NBC News said was distributed to staff. "The cancer is in remission and I will shortly go on a drug maintenance regimen to keep it there." Brokaw, 74, said in February he was diagnosed with multiple myeloma, which involves cancer cells overtaking healthy, disease-fighting cells in bone marrow. NBC said at the time doctors were "optimistic about the outcome of the treatment he is receiving." He is now retired from anchoring "NBC Nightly News," his primary role at the network from 1982 to 2004. He is now a special correspondent at NBC and his work includes chronicling the "greatest generation" of Americans, who grew up in the Great Depression and fought World War II. Last month, he was awarded the Presidential Medal of Freedom, the nation's highest civilian honor. President Obama said the nation "trusted him to tell us what we needed to know and to ask the questions that needed asking. I know, because I've been on the receiving end of some of those questions." In the Sunday announcement, Brokaw reflected on attending a ceremony with about 30 veterans commemorating the WWII Battle of the Bulge. "I flew home reflecting again on how lucky we are that generation gave us the lives we have today -- how my last year was a challenge but I was meeting it in world class hospitals with brilliant physicians, not in a foxhole in the Ardennes," he wrote. He signed the note "T Bone."